Your Shar-Pei is a mobile paradise for fleas, mites and other parasites. 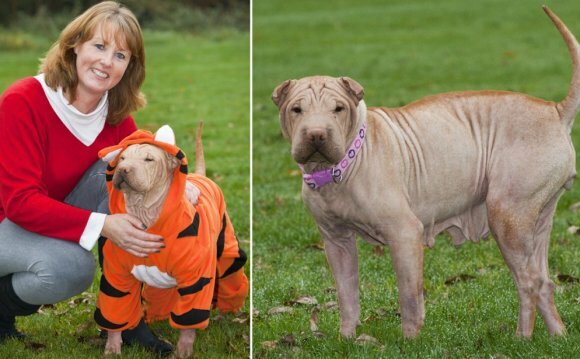 Saying that the Chinese Shar-Pei has skin to spare is a slight understatement. Wrinkles and folds are the foundation of the dog's aesthetic, but this unique trait comes with a few caveats. Mange mites thrive in the dark and protected crevices between the breed's innumerable layers of thick skin. Demodex mites are the agents responsible for puppy mange. These tiny parasites live inside the hair follicles of practically every canine on the planet. Mothers inadvertently pass them to their offspring shortly after delivery, but most young dogs never suffer from mange. In the majority of cases, the mites only feed on dead skin cells shed by their host. Thinking about microscopic creatures eating your dog's skin is a little disturbing, but the parasites rarely pose a threat to healthy dogs. Mange develops if the population of mites grows too much, which forces them to eat living cells as well as dead ones. Demodectic mange is often called puppy mange because it primarily affects young and adolescent dogs. It's a leading source of skin irritation in the Shar-Pei and is possibly the breed's primary dermatological concern, according to Dr. Jeff Vidt. There are two types of demodex infestation: general and localized. The term "puppy mange" describes a temporary local infestation. It's confined to certain area's of the pup's body and is not considered a serious health risk. Shar-Peis are one of two breeds that can also develop Demodectic pododermatitis, which is a severe mite-related inflammation restricted to the dog's feet. Generalized mange develops when the host's immune system is compromised and is much more dangerous than the local "puppy" version. Puppy mange is characterized by clusters of balding spots that are limited to a certain party of the dog's body. The groups of circular balding patches can appear anywhere, including your pup's face, legs and torso, according to True Gem Shar Pei. The skin in the balding areas looks scaly and reddened. The spots are itchy, so it won't take long before you catch your dog scratching the same spot over and over as he tries to relieve the irritation. In contrast, generalized demodectic mange covers large swaths of skin and eventually causes hair loss across the dog's entire body.